Yes. We have a limit of 5 guests. Please RSVP in AccessPlus by Thursday, Dec. 6, 2018. The RSVP will help us to plan for space and food needs, so it is important to be as accurate and committed as possible when you are responding to this event. If you have questions, please contact Holly Dunlay-Lott. 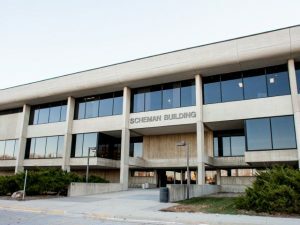 Parking is available on the north or south side of Scheman. Yes. We will be serving a continental breakfast for you and your guests to enjoy. Yes. All faculty and staff in the department are invited to the reception. The reception will be hosted by Dr. Richard LeSar, Interim Department Chair. University commencement will take place at 1:30 p.m. on Saturday, Dec. 15, in Hilton Coliseum. For more information, click here.